This 51 year old woman sustained a left open distal tibia fracture while weightlifting. The wound was grossly contaminated. Following irrigation and debridement her fracture was treated with intramedullary nail fixation by her treating orthopedic surgeon at an outside facility. In addition, her segmental fibula fracture had been treated by plate and screw fixation. Because of slow healing her treating physician tried another surgical method to promote healing of her fracture. When this treatment and an external bone stimulator failed to result in success the patient was referred in to see Dr. Brinker. 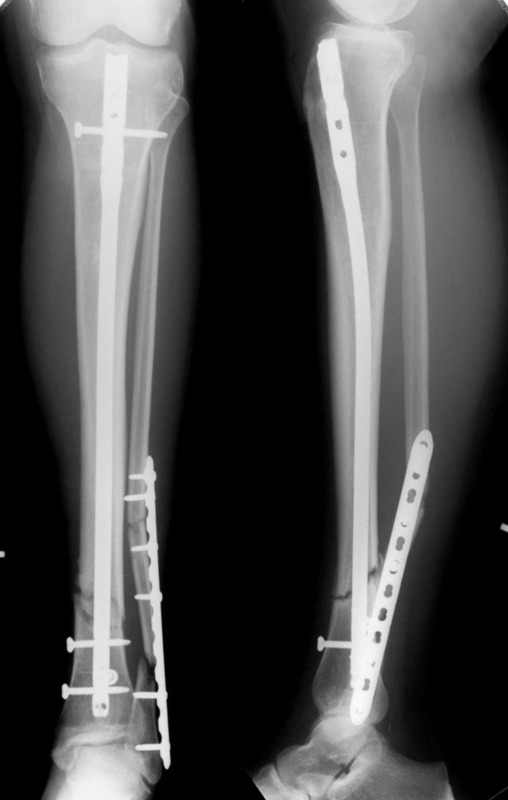 Following exchange nailing the patient’s tibia healed rapidly and her severe pain completely resolved. 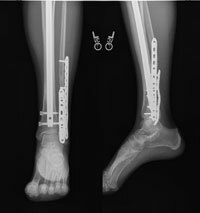 A second procedure, plate and screw fixation and bone grafting, was later performed to bring the fibula nonunion to successful bony union.